So for the last two weekends, the Michelson family has been road tripping down south and back up north to visit Olivia's grandparents. We had an incredible time in San Diego over Memorial Day weekend with my parents and brother and then again in Santa Rosa with Peter and Irma. It is incredible at how different it is travelling with a baby! Our vehicles were loaded down with all the "necessities" for Olivia...the breastfeeding pump and bottles, two sets of diaper bags, blankets, changes of clothes, the jungle gym, the Snuggle Nest, the car seat, the stroller, the Ergo Baby Carrier...the list goes on! Once child #2 comes along, we are going to need a 12 passenger van! Not to mention, we have to make a couple extra stops along the way for feedings and diaper changes. Today, I took Olivia to the grocery store on my own. 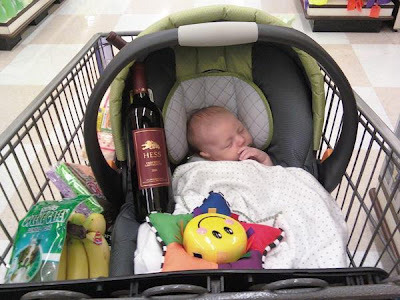 The following picture shows just how different it is shopping with a baby! I know that most people put the car seat on top of the shopping cart, but I read somewhere that it's a safety hazard, so I put her in the cart itself. Funny how I was still able to fit $150 worth of groceries in there around her. I wouldn't normally put a wine bottle directly next to our baby, but I took this picture on my cell phone for David to show him that I found this bottle of wine that Irma had ordered at dinner Friday night and was A-MAZ-ING! I can already picture how much stuff a baby will need when traveling- we have to pack an extra bag already for Pepper's bowls, beds, toys, treats, food, etc. when we go anywhere and she's.a.dog! Anyway, I've found that no matter the supply of accoutrements I take for Ellie, she would rather play with something banal like spoons or dirt and worms, so I just quit packing it all. That is except for the DVD player on long road trips. HOW DID WE SURVIVE CHILDHOOD ROAD TRIPS WITHOUT THAT? What is the wine called, I wanna try? I still haven't gotten my "post-baby buzz" on. I was going to ask for Olivia's ID card...then noticed it was Hess Estate! YUM! Many great adventures awaiting you...with the kitchen sink and all. Enjoy every moment. Love to all. Guess the aunt and uncle didn't make the blog cut! What are we, chopped liver?! It was good seeing you guys on Sunday even if it was only for breakfast. Hope the ride home went well.